Our first time making hard apple cider was both a success and a failure all at once. Let me explain. We successfully made the best tasting hard apple cider I’ve ever had in my life, but we also almost killed someone when we realized that bottles under heat can explode. This is one of those real life is crazier than fiction moments. See, my husband and I had brought the finished cider upstairs to sample. We had bottled them in those thick, glass Jim Beam bottles and put the crate on top of the portable dishwasher. Some time later, while loading the dishwasher, my dear husband and I had a difference of opinion that resulted in us going to our separate corners. He went off to his man cave and I started the dishwasher and then went to the living room to watch a chick flick on TV. Not too long after there was a terrible crashing sound. Both of us assumed the other was having a hissy fit and we met at either side of the kitchen to reprimand the other about being childish. Much to our surprise, the ceiling was dripping. Giant shards of glass were embedded into the ceiling and walls. The cider bottles had exploded thanks to the hot steam coming from the dishwasher vent. Oops! 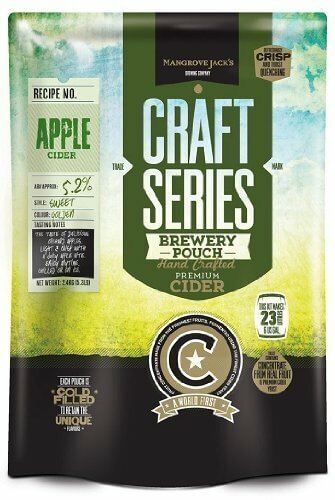 Fear not, exploding cider isn’t a common thing, though we proved it does happen. Don’t let that turn you off from the idea of making it. Just be sure not to store it anywhere that has extreme high temperatures, especially when it has just finished fermenting. You may find it easier to buy a kit if you don’t have a homebrew supplier near you. With this kit, you just add sugar and water. To make hard apple cider, you will need a few supplies. The nice thing is that after you have purchased the initial supplies, there isn’t much you will need to get for future batches. Juiced from fresh apples is the absolute best, but if you have to purchase apple juice from the store, make sure it doesn’t contain sorbate or it won’t ferment. 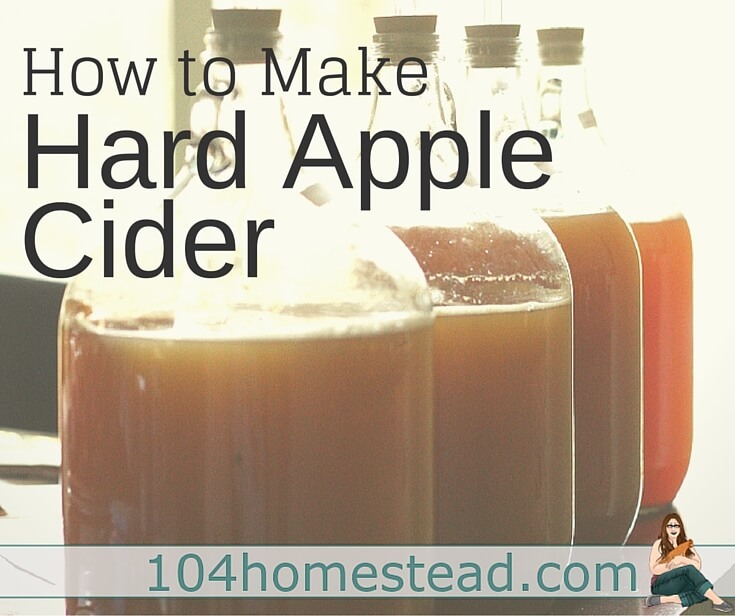 You will need five gallons of apple juice to make 5 gallons/2 cases of hard apple cider. Normal table sugar works well for fermenting and sweetening. I’ve also had good luck with brown sugar. I’ve heard of people using honey, but that seems pricey to me and I haven’t tried it myself. Maybe if you have your own hive it would be worth a try. You will need 2 lbs of sugar. Feel free to mix and match. You can find yeast at your local homebrew supplier. Some health food stores also carry it, as well as Amazon. I like Red Star Montrachet Wine Yeast, but I know people have had good results with Red Star Pasteur Champagne and Red Star Premier Curvee. Be sure to sanitize all of your equipment before you begin. If you use bleach to sanitize, instead of the mixes available at the homebrew supply store, be sure to rise very very well. Bleach residue obviously will prevent fermentation. Set aside 1 cup of your sugar. Put it in a tupperware or ziploc bag. You’ll use it later. Pour all but 1 quart of the apple juice into the carboy/bucket using the funnel. Add the sugar (except the 1 cup you withheld earlier). Carefully shake well. Add the yeast using the funnel and wash down any yeast that sticks with the remaining apple juice. You may need to wait for the foam to die down to add all of the remaining juice. Put on your lid if you are using a bucket and install the airlock. After you’ve put on the airlock, then put the carboy/bucket in a dark corner at about 70ºF. Not being the strongest individual on earth, I find it easiest to set up everything where I plan to leave it during the fermentation. Leave it alone for about four weeks. Clean and sanitize your bottles. Repurposing old bottles is completely okay and makes homebrewing much cheaper. Just make sure the caps you buy fit the bottles you’ve collected. As I said, I used old Jim Beam bottles. Do the math ahead of time to figure out how many bottles you will need to hold 5 gallons. Boil the 1 cup of sugar in about 2 pints of water in a saucepan for about 10 minutes to create a simple syrup. Once cooled, pour the syrup into the bottom of your second carboy/bucket. Now, you will siphon the cider from the carboy to the bottling bucket (or second carboy). Now siphon the cider from the original carboy/bucket to the new one. You may want to leave the bottom 1/2 – 1″ as this is sediment that will cloud your finished product. If you are fancy (or you plan to homebrew regularly), you can get a spigot for your second bucket, but I just use the 3/8″ hose. I recommend setting up your bucket right next to the sink. Until you get a rhythm, spills will happen. Arrange your bottles so you can easily reach them and have a towel nearby to place filled bottles. 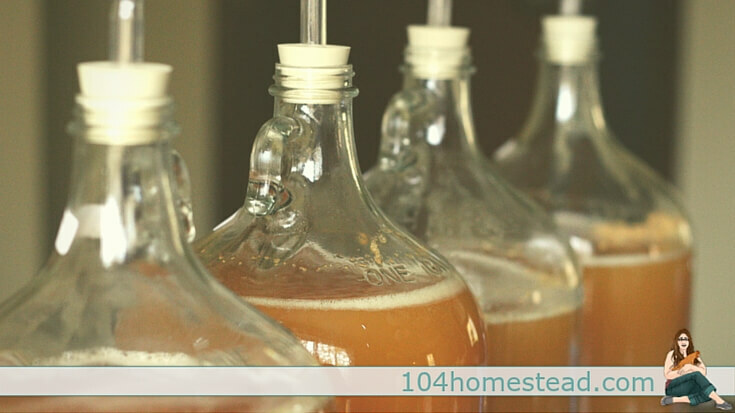 Slowly siphon the hard apple cider from the bucket into your bottles, leaving 1″ of head space for standard beer bottles (a bit more with larger bottles). Once they are all filled, give your bottles a quick wipe down with a bar rag to prevent slipping and then cap them with the capper. This is the stage where it’s important not to put your hard apple cider on your dishwasher. Leave your cider alone for two weeks so the simple sugar can carbonate the cider. Any yeast that was stirred up during the bottling will settle to the bottom of the bottles. You can allow your cider to rest for several months to improve the flavor, but I have yet to be patient enough for that. It’s worth mentioning that hard apple cider is one of those beverages that can sneak up on you. Take your time drinking them, especially the first time around. Speaking from experience, you don’t want to sip them throughout a long movie without getting up between bottles. You won’t get off the couch when the credits roll. i prefer mine fermented wild in the fridge in the mid 30sF. Fermentation takes several months this way, but the results are outstanding. The batches I’ve used commercial yeast in dry out way too fast, then for what I like it has to be stabilized and back sweetened. I’ve won a couple competitions that way, but I still think wild cold fermentation for cider Makes a far superior end product. Heat from a dishwasher or not, unless you’re very careful trying to referment code in bottles is risky and possibly very dangerous. Read a lot before you start and know what you’re doing! You will get a better tasting product if you first kill the wild yeast (which is present in all fresh apple juice) with metabisulfite. Then after 24 hours add your wine yeast. Thank you so much for this recipe, Jessica! 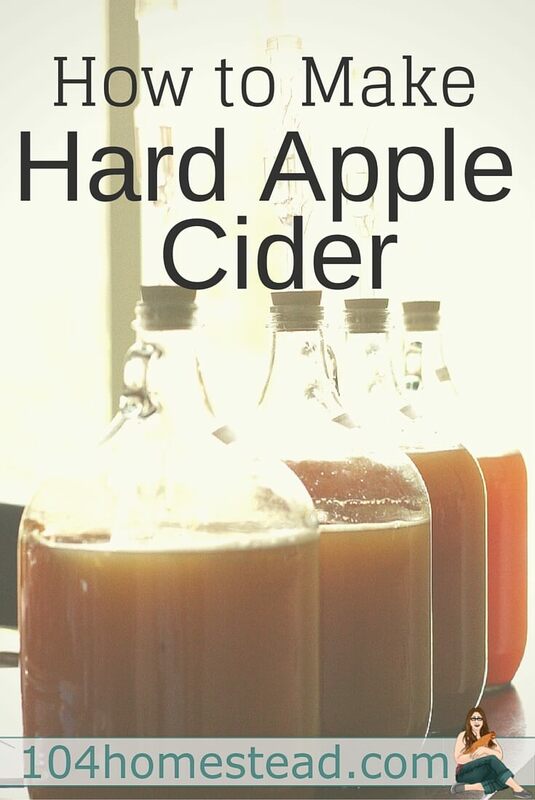 My hubby and I have been looking for a easy to understand recipe for home brewing juice from our home grown apples. Only 1 1/2 years ago, at our retirement, we began our homestead. (Better late than never, eh?) Now we grow our own vegetables in 400 sq ft of ‘chicken wire lined’ raised beds as we discovered our land has way to many moles for standard beds. Upside to moles is there are no grubs as that’s what they eat. We planted a tenth of an acre in semi-dwarf apples, semi-dwarf pears, dwarf persimmons, pomegranates, blueberries and red raspberries. Strawberries were planted in raised beds. We’re now studying how to best add a hen house or tractor to our homestead next Spring. Your articles are pleasant to read and easily understandable for older ‘city folk.’ Keep up the good, honest, hard work!